There’s no shortage of restaurants in the Big Apple, a city famed for its melting-pot of cuisines and cultures. New York City is estimated to have over 30,000 restaurants within its borders, so getting round them all would be nigh on impossible - especially on a week-long holiday. Sauce Restaurant isn’t the most glamorous restaurant in Manhattan, nor is it a truly authentic Italian experience, but there is very good reason for it being a Lower East Side favourite since 2011. Its retro décor, twinkling fairy lights and attentive service, combined with delicious homemade pasta and unctuous sauces that could be made by nonna, mean it’s a top tip for cosy, informal dining in a city filled with trattorias. The music is ever so slightly too loud, and the tables ever so slightly too close together, but the buzzy, relaxed vibe meant that we quickly acclimatised and joined the other diners in laughing and chatting unreservedly, in real New York style. This feeling of bonhomie led to us deciding to share our antipasti, starting with the mozzarella di bufala ($18). The cheese was creamy and plentiful, the tomatoes plump and juicy, and the sprinkling of black sea salt pulled the flavours and textures together beautifully. Our bowl of zucchini fritti ($9) was huge, and so moreish that were soon digging in with our fingers and devouring the crispy, pecorino-topped courgette with gusto. While the pizzas looked as good as any we’ve ever seen, Sauce Restaurant is all about, well, the sauce – so all four of us chose from the pasta menu. Simply pick one of the seven homemade sauces and your favourite style of pasta, and if you’re particularly hungry, add meatballs, sausages or ricotta (for a supplement). Two of us plumped for the handmade spaghetti, one with Passato sauce ($18) and one with Funghi ($12). Both were rich and flavoursome. The wild mushroom and brown butter sauce was particularly good: woody, creamy and fragrant, it’s definitely recommended. The rigatoni with the Mantecano sauce ($18) was spicy with a subtle hint of vodka, and made all the heartier with extra meatballs ($7). The only dish to fall slightly short of the mark was from the specials board: a tortellini pasta, filled with spinach and ricotta, and dressed with a chilled Verdi sauce and parmesan cheese. Had the sauce been hot, it too would have been a winner. Overall a thoroughly enjoyable experience, good value for money and well worth a visit. Inspired by the timber homes of Alsace, the award-winning restaurant Gabriel Kreuther is a very special place indeed. Situated in Midtown, opposite Bryant Park with glorious views of the Empire State Building, it is a dining experience to behold. We chose to dine in the bar & lounge, which is one of the most beautiful bars we’ve ever seen. Reclaimed wooden beams divide the bar area from the more formal dining room, and hand-painted wall coverings, one-of-a-kind artworks and cream banquettes add sophistication and warmth to the room, whilst an installation of 42 crystal storks hangs from the curved, platinum-coloured ceiling. Put all of thoughts of greasy burgers or fish and chips out of your mind – this bar food is an altogether more sophisticated affair. Alsatian-inspired dishes, such as Gabriel’s famous tarte flambées and homemade beignets with seasonal marmalade adorn the menu, alongside red wine-braised tripe gratiné and truffled liverwurst. We opted for a selection of dishes, including boudin noir with grilled spring onions and baby fennel ($27), chilled Maine lobster tartelettes ($24), marinated shishito peppers and olives ($13) and crispy potatoes with harissa aioli ($12). The dishes were plated like works of art, and somehow tasted even better than they looked. Dessert was also exquisite; we shared the chocolate tart with pecan chocolate sorbet ($17), whilst the apple strudel with caramel sauce and prune Armagnac ice cream ($17) was a grown-up twist on a classic. Whilst the food is faultless, it is the cocktail list that’s the real start of the show at GKNYC. The bartenders are a joy to watch and their creations are a delight to consume. The GK Manhattan ($24) was declared as “the best I’ve ever tasted”, while our younger companions would have quite happily sipped their In Earnest non-alcoholic mocktails ($12), made with Seedlip Spice 94, clarified pear juice, ginger, honey and lemon, all evening long. The Tavern on the Green first opened as a restaurant in 1834, and other than a short hiatus from 2009-2014, has been a New York institution ever since. Situated in Central Park, we enjoyed a brisk walk to work up our appetites before our lunchtime visit. We were pleased to have secured reservations ahead of time, as The Tavern’s reputation clearly precedes it; the queues were out of the door, with dozens more hungry visitors sipping cocktails in the bar whilst they waited for an available table. We were whisked straight to our spot in the pretty Central Park room, with floor-to-ceiling windows overlooking the courtyard on one side, and views to the open kitchen on the other, meaning we weren’t short of sights to take in. As one of the few restaurants in NYC with the capacity to host large groups, The Tavern on the Green is big, busy and often noisy – so if you’re looking for a quiet oasis in the middle of the park, this isn’t the place for you. If, however, you’re hoping for hearty, “pub grub”-style cooking with the best people-watching in Manhattan, get booking. Despite the great atmosphere, the food here was a little hit-and-miss for us. The beer-battered fish and chips ($28) were crisp and light, served with watercress salad dressed with tangy malt vinaigrette, but unfortunately the salmon burger ($25) was a disappointing choice. Served with cilantro fennel salad, sweet potato fries and chilli aioli, the flavourless burger was dense and heavy, however the fries were gloriously crisp and tasty. From the specials menu, we chose the delicious Maine lobster pot pie, and the vegetarian dish of the day, roasted vegetables and grains. However, at ($23), this felt more like an overpriced extra-large side dish than a main course. Situated at the back of a Spanish gourmet market, the tapas bar at Despana is one of our favourite eateries in New York. Meats, cheeses, olives, cod, prawns, the most delicious bocadillos (a sandwich, yes, but really, so much more) and the most authentic patatas bravas outside of Spain are all available here. This relaxed little bar is the perfect place to kick back and enjoy a glass of wine with the freshest, tastiest Spanish cuisine, right in the heart of Manhattan. The service was warm and hospitable, and co-manager Ginellys knows her menu inside out, so trust her recommendations – her advice on what to order and the quantities were spot on. Space here is tight, so make sure to book in advance, but even if you have to queue, Despana is well worth the visit. You can’t go to New York without going for pizza, and the award-winning Speedy Romeo was recommended to us more than once. After our visit, we understand why. 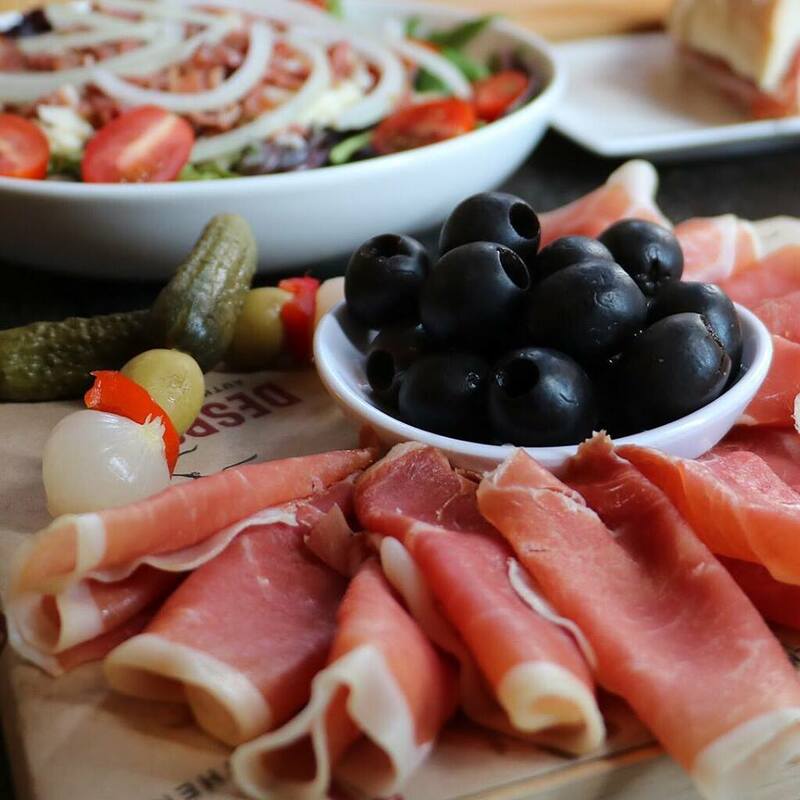 Filled with locals enjoying craft beers and fresh pizzas straight out of the hardwood-fired Italian oven, the atmosphere in Speedy Romeo is almost as captivating as the food itself. Simple, well-crafted pizzas, made with the freshest ingredients, make for an excellent dinner in a laidback setting. Buzzy and busy, with loud music and even louder locals, this is not the place for those looking for a quiet dinner for two. However, if you’re keen to see some New Yorkers in their natural habitat, Speedy Romeo is where you need to be. The tables were too close together, the service was inattentive at best and the overhead lights were glaringly bright, but fresh off our flight we were ravenous. We over-ordered (but then, we usually do when it comes to Chinese food), and we completely misjudged the portion sizes - but we soon tucked in to some of the most flavoursome dishes we’d had in ages. The broccoli in garlic and chilli was divine, the vegetable fried rice was packed with umami, while the kung po king prawn was a dish I could happily eat every day for the rest of my life. There are hundreds, maybe more, of Chinese restaurants to choose from in NYC, but if you want fast, tasty, relatively cheap food then give this place a try. Before our trip, everyone told us to try Russ and Daughters, The Clinton Bakery and Katz’s, but no matter what the time of day or night, these eateries were always packed out, with queues down the block. We stumbled upon Remedy Diner, and boy was it one happy accident. The breakfast here was so good that we returned, not once but twice, to feast on slabs of French toast smothered in syrup, waffles and pancakes topped with strawberries and cream, and soft bagels smeared thickly with cream cheese. Decked out exactly as you imagine a New York diner – with booths, a bar and waiting staff with jugs of steaming hot coffee in hand – we could happily sit in Remedy all day. Prices are very reasonable and the service friendly and super-efficient. Sure, diners are ten a penny but this one is worth adding to the itinerary. You don’t eat at Chat n’ Chew for the food. Although its emphasis on cosy comfort food (think mac and cheese, hearty burgers, grilled cheese and club sandwiches) was exactly what we needed one very cold, rainy lunchtime, you dine at Chat n’ Chew to feel like you’ve just stepped onto a movie set. This is a slice of NYC that’s as authentic as a pretzel in Central Park. Expect native New Yorkers, chewing the fat over life in the Big Apple, with decent food that’s as fresh and local as it can be in the heart of Manhattan, good service and fair prices. Ivan Ramen is a hipster’s paradise. The cool-kid staff, wearing the store’s branded merch, show you to your high table, and bring a capsule menu where there are more craft beers on offer than variations of soup. This was one of the busiest restaurants we frequented, proving that owner Ivan’s reputation as one of the city’s leading authorities on Japanese food is strong as ever. The ramen was tasty, if slightly too potent for our tastes – we all agreed that we’d prefer a lighter, clearer broth than is on offer here. However, the carefully-selected beers and designer lemonades were high quality, and cut through the depth of the broth. Ramen shops are very popular in NY as the concept of fast, tasty, healthy food fits perfectly with the busy Manhattan lifestyles – and Ivan Ramen ticks all of these boxes. Situated on the East River, Industry Kitchen is a restaurant that boasts unobstructed views of the Brooklyn Bridge and skyline - a must-visit to take in a slightly different angle of this incredible city. Industry Kitchen has something of a schizophrenic menu – boasting the world’s most expensive pizza (why??) 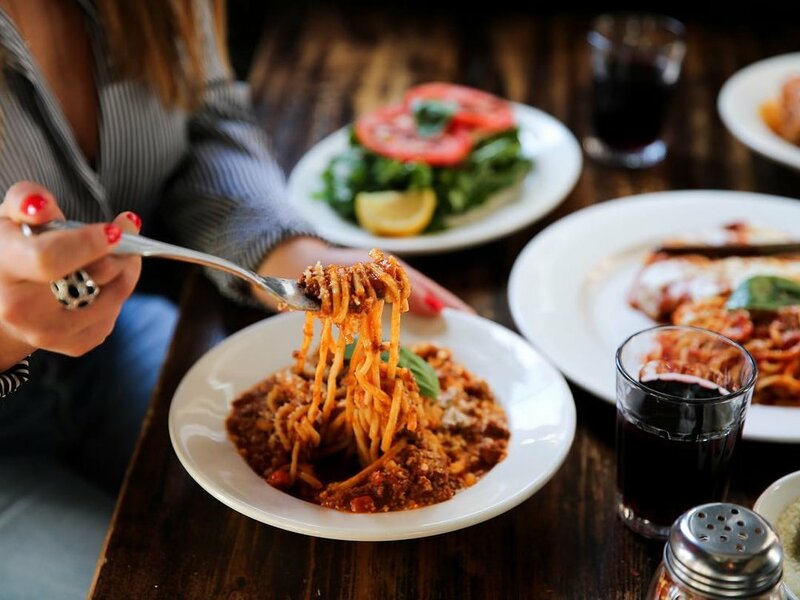 alongside French onion soup, braised lamb shank, steaks and a range of salads…but our advice would be to stick to the pizza and pasta menu and you won’t be disappointed. With a location and interior like they have here, it is easy to while away the hours at Industry Kitchen and be sure to try the cocktails – they are scene-stealing.